Doreen is a fantastic host and made us feel very welcome ,the B&B does how ever have a road to the front and although at the rear its a car park there is another busy road beyond this too. the house was spotless ,the food plentiful and such a variety including breads and rolls for the coeliac member of our party.Doreens beds are a little on the hard side but has lovely bed linen and provides basic toiletries, great if you have forgetten something.Tea coffee and biscuits provided in the rooms.. I love the TreeTops! It's the best place to stay in Sligo Town! It was my third time that I stayed here and I would definitely come back the next time. The rooms are lovely, the breakfast is delicious and Doreen is the most friendly person I ever met! Thank you for everyting Doreen, it's always a pleasure to stay at TreeTops BnB. Doreen was a wonderful host. Our room was clean and comfortable. Breakfast was good. It was a short, less that 10 minutes, walk to restaurants and nightlife. Tree Tops is a nice quiet B&B. Very nice, clean and comfortable. We had a lovely stay at Tree Tops B&B. Doreen was delightful and provided a lot of little extras to make our stay comfortable. The continental breakfast was a beautiful buffet of fresh ingredients! Estuvimos una noche en el B&B. Fantástica atención por parte de los dueños. Habitación correcta, desayuno correcto, todo sin excesos. La limpieza podría mejorar. Estupenda comunicación con los propietarios. Very nice B&B with large very comfortable room. About a 10-15 min walk into town. Doreen was quite knowledgeable and spent a lot of time helping us out with our plans in Sligo. She made our stay very enjoyable. We had a pleasant stay at Tree Tops. The footwalk distance to the town was perfect for eating out. Our room was clean and cosy. On top, the breakfast was perfect. We had a great 2 night stay at Tree Tops B&B. Our room was excellent, the breakfast delicious and our host Doreen one of the kindest persons we met in Ireland. A lovely place! Great location! Hearty breakfast! Interesting art work! We had a wonderful experience. A great value. We had a very pleasant stay at an extraordinary kind host Doreen. Staying in Sligo it is a first choice accomodation. Being few minutes walk from city we missed nothing and had a really good time. Doreen was such a wonderful host, we could not have asked for more. The location is good, just a 10 minute walk into the city center and the rooms were really well furnished. If you are going to Sligo, do yourself a favor and stay here! Sehr gute lage, sehr sauber, gute Gastgeber. Unsere Wahl in Sligo war ausgezeichnet. Jeder Zeit wieder, sehr zu empfehlen! The Tree Tops location is good within a walking distance from City Center. Doreen is a very wonderful woman , She welcomed us warmly , She and her husband helped us with the luggage., She gave us information about where to go and what to visit , provide us every day with a new map and information... One time she drove us to our destination. The House is very clean, beautiful well decorated, relaxing and very organized. The breakfast is rich with wide variety for different taste . We had a very nice stay in Sligo. A lovely place to stay five minutes walk from the centre. A warm welcome is guaranteed and it makes a refreshing change to be offered a buffet breakfast rather than the full Irish. The rooms are spotlessly clean, extremely comfortable and their is a guest lounge to relax and enjoy. This was our second visit to Tree Tops, which will give you a clue that we liked it. You couldn't ask for a more attentive hostess. The rooms are clean and comfortable and have plenty of space. It's convenient for the town without being in amonst the busy traffic. Although there is no cooked breakfast now, the array of alternatives, cereals, breads, fruits, juices, cold meat and cheese was more than enough to fill the gap. Highly recommended. We'll be back next time we're in Sligo. An excellent place to stay in Sligo. The house is very comfortable and clean.The gardens beautiful. Nice walk into town for great restaurants. Doreen is a wonderful host who certainly made our stay more enjoyable with her recommendations and even made our reservations ! The place was really nice, clean and good conditions. Bed and room were very comfortable. Good breakfast. Location is just a few minutes walk from the city centre in a very quiet area, so a good spot. Doreen was very friendly and she gave us a friendly welcome and some tips of where to go and dine. I would definitely recommend it. The accommodation, breakfast, friendliness of the owner could not have been better. Doreen deserves most praise. excellent B & B great welcome, clean rooms, good breakfast. It is an excellent location within walking distance to town centre. Definately the best B&B iv ever stayed at! Doreen was the most fabulous host and couldnt be more helpful and kind! Our room was just perfect! So cosy and warm, absolutely spotless with everything supplied! If we ever have the pleasure of returning to Sligo in the near future our first stop will be Tree Tops! Pure luxury! We had a very enjoyable two night stay recently. Doreen is a very pleasant and helpful host and gave us useful information to make our stay enjoyable. The bedroom was spacious and very comfortable and the buffet breakfast had everything we would wish for. The location is vey quiet and only about 15 minutes walk from the town centre. This is possibly the best B&B I have ever stayed in. Our host & hostess were friendly & helpful. The house is beautifully furnished and spotlessly clean. The room was spacious and quiet. Breakfast was delicious. The location meant a short stroll to the centre of Sligo Town. We had a car, so the off-street parking was an added benefit. As you can tell, I loved the place and would recommend it to any traveller. I thoroughly enjoyed my stay in the Tree Top B&B, extremely friendly, excellent value and great accommodation. We really enjoyed our stay at Doreen's house. Room and bathroom are nice and everything's clean. Breakfast was best very good. Zimmer war sehr sauber. Lage ausserhalb der Stadt, für unseren Bedarf Konzert in einem Hotel ausserhalb der Stadt ideal. Dadurch auch sehr ruhig gelegen, etwas zu weit weg vom Zentrum Sligo. Das Frühstücksbüffet sehr liebevoll präsentiert und umfangreich. Das Haus mit den vielen Bildern und Kunstgegenständen unglaublich heimelig. My wife and I were delighted with our stay at Tree Tops. The accommodation is very conveniently located within easy walking distance of the center of Sligo. The room was everything we could have wished for and spotlessly clean. Breakfast was copious and delicious and set us up for the entire day. Last not least, the owner of Tree Tops could not have been more friendly and helpful to us during our stay. I would have no hesitation in recommending this accommodation to others. What a warm welcome by Doreen!!! Beautiful home, one of, if not the cleanest, we stayed in during our three week vacation. Room was nicely furnished with lovely linens. Bathroom was well maintained and we loved the heated towel bar. Breakfast was sufficient. Doreen doesn't cook a hot breakfast and that was perfectly fine with us as we were all quite tired of the big breakfasts. There is a nice variety of dry cereals, fruits, berries, yogurt, toast, etc. This B&B is close to town centre and quite a lovely walk. Located just a few minutes walk from central Sligo on a quiet street. Doreen, our hostess is very friendly and informative and we enjoyed talking with her, our room was a bit small, but still very comfortable and suits our needs, breakfast is unique - no cooked meal which is a refreshing option, nevertheless it was very rich and tasty, so many options to choose from. Highly recommended accommodation. Doreen is a very nice hostess and full of information. The house was comfortable, clean and quiet. Breakfast included oatmeal, ham and a large variety of fruits and pastries. The on site parking and short walk to town make it an excellent value. Doreen was just a wonderful nice lady to talk to, enjoying some conversation with us and exchanging needed information. The house was nice and well furnished, warm, the breakfast buffet was just wonderful, especially for the ones who prefer something different from the full Irish breakfast, and view to the garden just beautiful. Parking place inside, short walk to the city center. Nice wide clean room, comfortable shower room, couldn't be better. 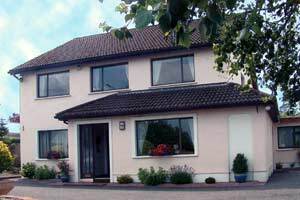 Nice house 5 minutes to Sligo center, large and clean bedroom, comfortable bed, good wifi. Breakfast is a buffet but plenty of choice. The B&B is very comfortable with luxurious bedrooms. Easy to reach, it is also close to the city center with several restaurants located nearby. Top class in every respect. Probably the best we've ever stayed in and at a very fair price. Doreen made us very welcome, we'll definitely be back! Excellent location warm welcome very clean. We stayed at Tree Tops for one night and can highly recommend booking a room there. Everything was very clean and comfortable and the breakfast was really, really good. Plus Doreen, our host, must be one of the nicest people we have met during our time in Ireland. We had a beautifully clean and comfortable room, and had an excellent choice at breakfast in the morning. Thoroughly recommended. We were very welcome and very confortable. Great stay at Tree Tops! The house and room were clean and comfortable and Doreen really lovely person. She gave us lots of tips and advice about where to go, places to visit and to eat or listen good music. The house is not far from city centre, in a quite neighbourhood. Definitely we'll stay again in Tree Tops if we go to Sligo in future! Treetops is just a short walk from the town centre of Sligo, which is a perfect location for visiting various sites in the region. The owner Doreen was very welcominhg and had many recommendations for dining and entertainment in Sligo. The location is calm in a residential area. Overall, Treetops was one of the best places we stayed during our trip through Ireland and it was a great value for the money. Best value for money that we experienced in Ireland. Meticulously clean, spacious room, outstanding art, tasty breakfast, very fair price. We met the Mrs., Doreen, and she's an informative and thoughtful host. Tree Tops is not right in the center of town- but that suits me, as it's a quiet and tranquil location and no more than a leisurely 10 minute walk into town.. Pleasant well located accommodation. Very pleasant owners and superb service. The Tree Tops B&B is a great place to stay in Sligo. Doreen is so lovely and we felt welcome and at home from the first moment she opened the door. The rooms and bathrooms are very clean and comfortable. The breakfast is simply amazing, you get everything you can think of. Excellent stay. Very nice host - helpful, pleasant and most accommodating. Highly recommend. Enjoyed our stay here. Very comfortable and accommodating. Warm and welcoming atmosphere. Would stay here again. Highly recommended. Wonderful! Doreen is sweet, accommodating and very friendly. She provides a nice continental breakfast spread. Beds are very comfortable with high quality sheets and blankets. About 10 minutes walk to downtown. Right on the street but quiet when it's time to sleep. Incredibly clean house with walls covered with original paintings. Room had tea/coffee making plus TV plus air con. Fantastic breakfast and great advice on where to eat. Outstanding buffet breakfast. Excellent art around the home. wonderful B&B,clean comfortable near to Sligo town and other tourist attractions. A very kind and helpful lady. Perfectly clean. Doreen made every effort to make us welcome and cared for. The wide variety offered in the breakfast buffet was a welcome change from a heavy full Irish breakfast. We had a lovely stay here and everything was perfect. The lady of the house was delightful and very kind and helpful. I really recommend it. I stayed at the Tree Tops B&B for one night recently at Easter weekend. The price was reasonable and it was one of the few places I rang that would let you book in for one night at Easter weekend most places, inc. B&B’s, had a minimum 2 night stay. I found the Tree Tops to be very clean, the room was spacious, the bed was large, there were lots of towels in the bathroom, and it even had toiletries such as body wash and shampoo that you would usually only get in a hotel, which was a nice touch. There was tea and coffee making facilities in the room and biscuits too! The location is about 10 mins walk into town, so we got a taxi in, which Doreen ordered for us. The taxi man charged €8 which was a bit steep considering it is not far, and it was only €5 on the way back and taxi’s usually charge more later on. Check out at the B&B was supposed to be at 11am, but we didn’t come down the stairs until 11.30am and hadn’t expected to get any breakfast, but Doreen told us to go in and sit at a table and showed us where the cereal was and came out with tea and toast for us. She had no need to do this, as really we had missed breakfast, so this was very good of her. I would recommend this B&B and would stay here again. Muito bom. Excelentes instalações, muita simpatia por parte da anfitriã, e muito bom pequeno almoço. Tree Tops B&B was absolutely lovely, and Doreen was the perfect host. She was kind enough to help us plan our days, give suggestions, and even lend us rain jackets and umbrellas when we didn't have them. The B&B itself is very well-kept. We especially loved all of the beautiful wall art! The breakfast spread was beautiful, and Doreen was so accommodating every morning. It's a great location as well; it only took us about 10 minutes to walk to the town centre. I'd highly recommend Tree Tops to anyone going to Sligo. If I go back again, it's the only place I'd stay. Superlative. Great Doreen, the perfect b&b for a perfect holiday. the place was immaculate, Doreen was very frienly. One of the best B&B we ever stayed!!! The hostess Doreen is the kindest person we met in Ireland. We felt at home. We got a lot of wonderful advices from her. The room was very comfortable and clean. The breakfast was spectacular! One funny thing is that Doreen apologized for not having an Ireland breakfast but who cares about it when you have the richest breakfast with a table full of different kind of food almost everything you can imagine in front of you The only thing we didn't like is that we stayed there for only one night :. If you are in Sligo, we strongly recommend this B&B!!! An excellent choice for staying in Sligo town! Doreen is a superb host, really helpful, attentive and knowledgable about the area. Our room was spacious and extremely clean, and the facilities were regularly cared for; you can tell this is a much-loved home! The continental breakfast was vast and fresh. Great value for money. Lovely location, Close to the town, 5 mins walk. Comfortable room. Mná an tí very welcoming and Friendly. My husband and I really enjoyed our stay at Tree Tops. Our host was very gracious and made us feel welcome. Room was clean and lovely, and bed very comfortable. We were not lacking anything. Buffet breakfast was more than ample for the start of another day of touring. Walk to city centre was an easy 10 minutes. Enjoyed all the artwork on display. I would highly recommend this B & B to all. Very nice large room, extremely clean. Price reduced when breakfast changed from full to continental which was ample. Short walk into town. We stayed in September 2014 in Tree Tops B & B and enjoyed it very well. Everything was clean and the breakfast was delicious and plentiful. Once again we are planning a trip Ireland, then we will stay securely in Sligo at this B & B. This is a lovely B&B within a short walking distance from downtown Sligo. The owner, Doreen, was warm and welcoming and provided us with great information on the local restaurants. Everything was clean and comfy. Breakfast was simple but sufficient and delicious. I would happily stay here again. This was a B&B with excellent facilities. The room was spotless and appropriately appointed. Doreen was a delightful host who was able to provide an very good breakfast. Thoroughly recommended. Our stay at Tree Top was probably the best of all the B&Bs we stayed in during our recent visit to Ireland. We were greeted each morning with a wonderful breakfast. Our rooms were beautiful.....so clean, comfortable, and inviting. We couldn't have asked for a more gracious hostess. We highly recommend Tree Top. The hostess was delightful, so helpful and pleasant. Breakfast although no cooked items was way more than we expected, such a variety. Room was lovely and comfortable. lovelyb&b the owner was very helpfull and the food was good, typical Irish hospitality. We had a lovely time and our host was incredibly helpful and friendly. The breakfast was great with many buffet options. We loved staying at Tree Tops! Doreen is a total delight with a servant's heart. Delicious breakfasts, immaculately clean rooms, within walking distance to downtown Sligo which has great restaurants and shopping. We plan to stay here again during our next trip to Ireland!! Lovely b&b. Room was very comfortable and quite spacious. Located in close proximity to Sligo town but yet is on a quiet road therefore is quiet at night. Landlady very friendly and grey freedom to come and go as you please. A great place to stay visiting Sligo, but a little bit difficult to find... A very friendly welcome, a large and clear room, very clean, a great breakfast only continental and Doreen is wonderfull...! A B&B not to be missed! Doreen war einfach umwerfend liebenswert und hat uns viele wertvolle Tipps und Auskünfte gegeben. Und, obwohl sie kein Irish Breakfast mehr anbietet, war ihr Frühstücksbüffet eines der besten, die wir in Irland bekommen haben! Sehr empfehlenswert! Really nice B&B. Rooms very modern and well equipped for price. Doreen is a lovely host. About 10/15 minutes walk from town. Not a huge amount of parking space so you might need to move your car but no big deal. Doreen was a very sweet hostess, I enjoyed meeting her very much and the breakfast was delicious!! Excellent B & B in every way. Very hospitable and helpful. Wonderful breakfast. Outstanding. Tree Tops is a top stay. Doreen is a adorable host and guide in a beautiful house. We regret that we booked just one night. this is an excellent B&B. the lady of the house is an absolute darling and cant do enough for you. Comfy bed, roomy ensuite, everything is so clean it shines! and the food is lovely. Die Gastgeberin war sehr zuvorkommen, freundlich und immer Hilfsbereit. Die Lage ist sehr gut, in knapp 10 Minuten ist man mitten im Zentrum von Sligo. Das Frühstück war sehr, sehr gut und liebevoll angerichtet. Die Zimmer liebevoll eingerichtet und sehr sauber, einzig die Badezimmer sind ein bisschen klein. Kurzum unser absoluter Favorit der B&B's die wir auf unserer Irland Rundreise besucht haben. Lovely hostess. Lovely home. One of the best breakfasts on our trip. We had an excellent stay at Tree Tops B&B. It's immaculately clean and Doreen is warm, welcoming, and helpful. Her breakfast is wonderful, with a generous supply of fruits, nuts, cheese, yogurt out on a self-serve buffet, and she takes orders for a hot breakfast to go along with that. The location is good -- a five or ten minute walk to the center of Sligo Town. Very good value. What a wonderful place. Hospitality was fantastic and Doreen went out of her way to make us feel comfortable. She took lots of time discussing with us the area and helpful hints to shorten our search for family in the region. Breakfast was great and rooms very comfortable. Highly recommend this B&B. Great place to stay in Sligo. Room beautiful - Doreen , a wonderful hostess, nothing a problem, great advice on what to see and do . Stunning. Best B&B I have ever stayed in. Ever. We had a beautiful stay at Tree Tops. The house was even nicer than it looks in the photos. Spotless and very comfortable. Doreen is a wonderful host. She helped us find our way around and went out of her way to help us rent a car. Sligo is a beautiful place. We would definitely visit again! We Stayed here in Feb 2014. The lady was very pleasant , the food was good and the house was very clean. Doreen was a wonderful hostess and very interesting to speak to. She went out of her way to make sure I had plenty of gluten-free food for breakfast - the breakfasts were spectacular. Thank you very much for a great experience. I selected Tree Tops after a friend had recommended it. What a great place to stay! It is about a 10 minute walk from downtown, but I would never stay anywhere else closer after staying here. We booked two amazingly clean and cozy ensuite rooms. I have stayed at many B&B's over the years and I can tell you, Tree Tops has the best breakfast I have ever experienced. Doreen who runs the show here spoils you from beginning to end. Doreen was an excellent hostess. The B&B was very convenient to the town. We were able to walk to dinner. Doreen had gluten free bread for my daughter and toasted it in the oven to avoid cross-contamination. Excellent B&B. Doreen was so welcoming and accommodating and very friendly. The room was lovely and Doreen's attention to detail was noticed. Breakfast was one of the best we had and the food was plentiful. Doreen was a lovely host. The B&B was only about a 10min walk into town so after a big breakfast this was a welcome bit of exercise. Very nice B&B with an absolutely perfect host!!! Doreen is a wonderful person, she is always bustling and helpful. The breakfast was good and we had a nice view on Ben Bulbin. The room was very clean and comfortable. The walk to Sligo City takes you only 10 minutes and the area around Sligo is really wonderful! Thanks Doreen for a great stay!!! Good breakfast and nice welcome from the women but her husband is quite unfriendly. The room is confortable and very clean. There is not enough place for the cars when all rooms are booked.